Our weekend in Lithuania to kick start 2018 will absolutely remain as one of the highlights of the band’s history. 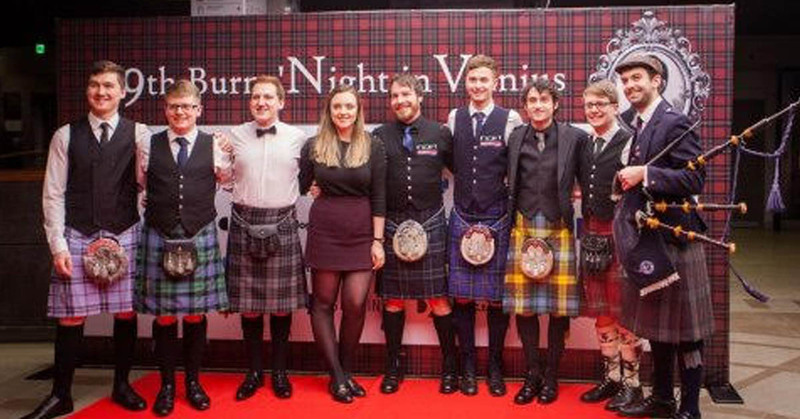 We were invited by the British Chamber of Commerce in Lithuania to play the organisation’s 19th Annual Burns Night event. We flew into London Luton on the Friday night full of excitement but it was short lived as we had to get to bed early (not very rock and roll!) for a 4AM start. Fortunately we all survived and we landed safely in Vilnius at 11:20AM and were whisked straight to the Palace of the Grand Dukes of Lithuania to set up and soundcheck. It’s a hell of a building. The main dining hall is an amazingly eloquent room and the ceiling is pretty impressive in itself. The stage set up was fantastic and we all got the sense there and then that it was going to be a special night. And so it proved. We were greeted with the flashing cameras of Lithuania’s paparazzi on the red carpet which is always a bit of a surreal experience in itself. I was responsible for piping to welcome the guests and so the evening began. Before long, Ross and I were up again on haggis duty where I piped the beastie in while Ross delivered a fine, rousing Address To The Haggis to kick start the party. And then we were up for the first set of the night: Face Palm, Never Gonna Give You Up, Shang-A-Lang and Take On Me. It was over before we knew it but we were pleased enough with the reaction. Soon we were up again for our second set of Transformation Blues, Rock Me Mama, I’m A Believer and Livin’ La Vida Loca. It may have been the extra whisky consumed by both and cried by this point but the place seemed to come alive at this point and we were delighted with the reaction. Ross and I often have a moment or two where we look to each other and have to pinch ourselves at what we are doing but this was absolutely one of those moments. After our set, we were mobbed by Lithuanian’s, Norwegians and Scots alike all wanting to express how much they had enjoyed the show. We were amazed to hear how much Edgaras Jankauskas enjoyed our set. For those that don’t know he’s the Lithuanian National Football Manager and the only Lithuanian ever to win the Champions League (with Porto under José Mourinho no less!). He was an absolute gentleman and it was a privilege to have such an in depth conversation with him. And so it was done and we were downstairs to Ceilidh dance to our pals The Flingstones and then round to the after party at the Kempsinki Hotel, what we were soon told is the most prestigious hotel in all of Lithuania. Sunday hit us with a bit of a bang and we were soon heading home via a stopover and tourist jaunt around Brussels. We’d like to thank Sandra, Chris and Karolina at the British Chamber of Commerce in Lithuania for looking after us so well. It was a very special weekend and we sincerely hope to return in the future. February is a little quieter for us, but we’re back in action in Amsterdam on March 3rd. I’ve a feeling that’s not gonna be a quiet one….